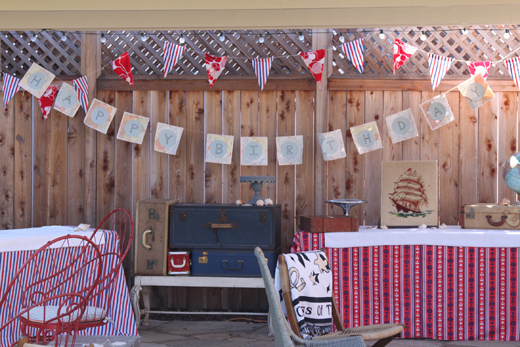 Vintage Clothing Blog | Vintage Wedding Dresses | Salvage Life: A Nautical Birthday Party! 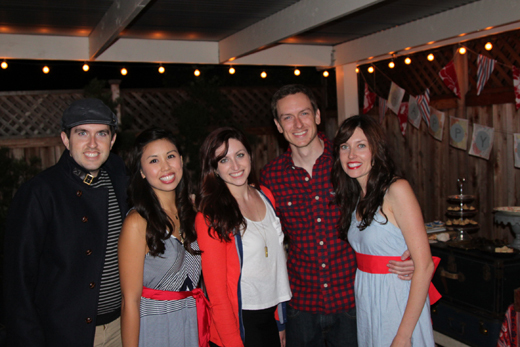 Over the weekend I threw myself a 30th birthday party. Everyone said I shouldn't have had to do all the work, but I REALLY like throwing parties and I am a control freak about the details. I did have a few helpers and I think it came together pretty well. 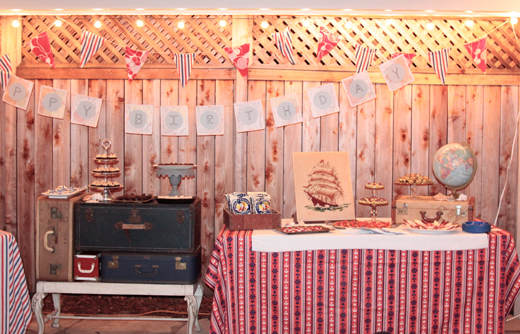 The party was a nautical theme and we hosted in the backyard. It started at 7, but here is a photo from earlier in the day when we were setting up. Instead of having tables, I created several seating areas, it felt a lot cozier that way. I made some flags from fabric and a happy birthday banner with an old Thomas Guide. One of the seating areas. 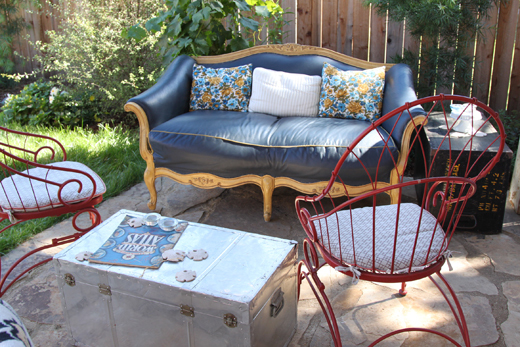 I bought this darling settee at Goodwill last week, score! 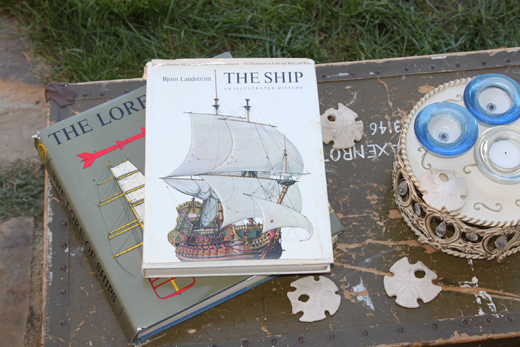 I used a bunch of old trunks as side tables and decorated with nautical books and sand dollars. It was getting dark, just as the party started and our little globe lights provided the perfect ambiance. 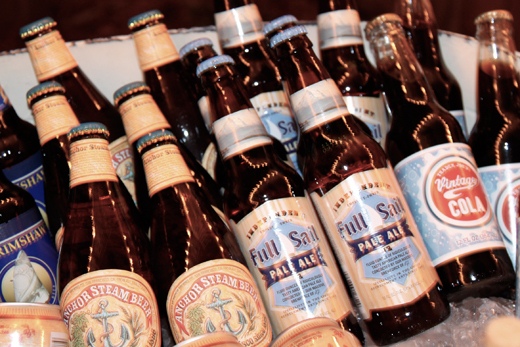 I found nautical themed beer and blue and red labeled cola. 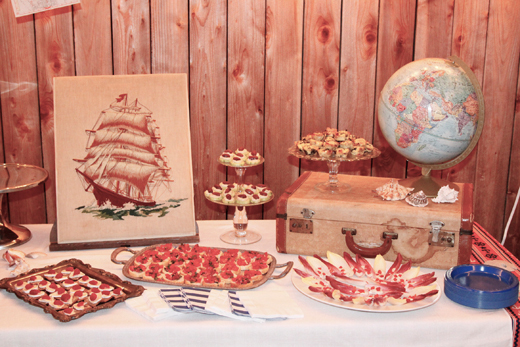 I borrowed the globe and ship art from the shop to decorate the food table. 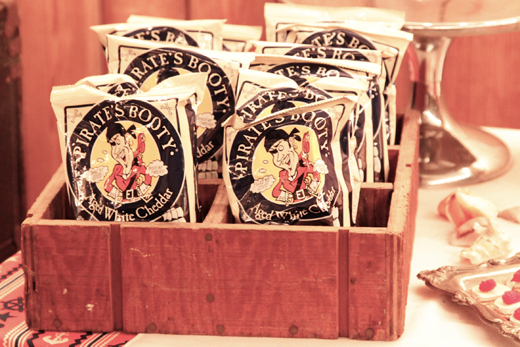 We had to have Pirate's Booty because it goes with the theme and it's delicious! 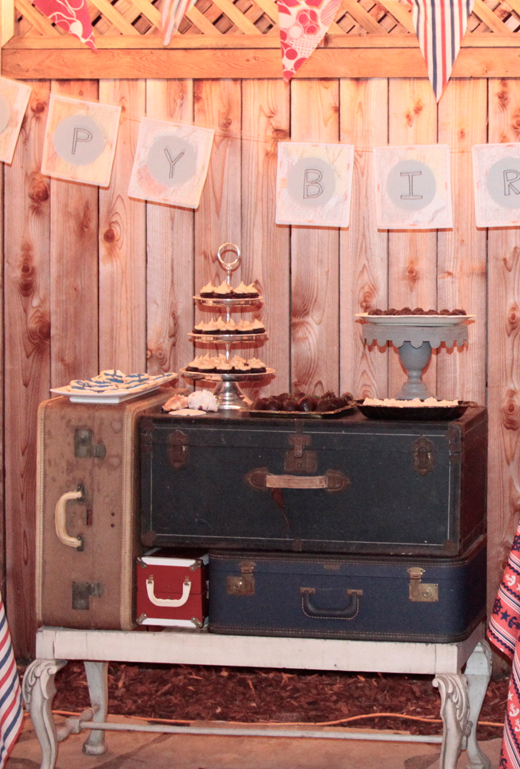 The dessert table was a bunch of old trunks stacked on a bench. 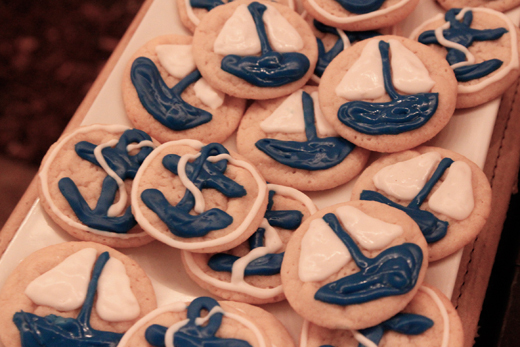 This is where I got a little crazy, I decorated these cookies with anchors and sailboats. I saw some cute ones on Etsy, but I waited too long to order them. The internet has so many great things, but they aren't good for last minute people. 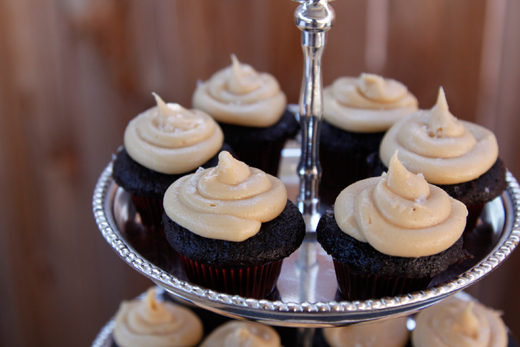 I made these sea salt caramel cupcakes with chocolate cake mix from Tj's and used their frosting mix, but added caramel sauce and used salted butter instead, sprinkled with a little Maldon salt. Delicious! I also made dark chocolate covered cookie dough balls, chocolate covered strawberries and white chocolate covered rice crispy treats. Me and my sis. I found this dress at a thrift shop a long time ago. I added the sash and found these shoes at another thrift shop on Friday, they were perfect! 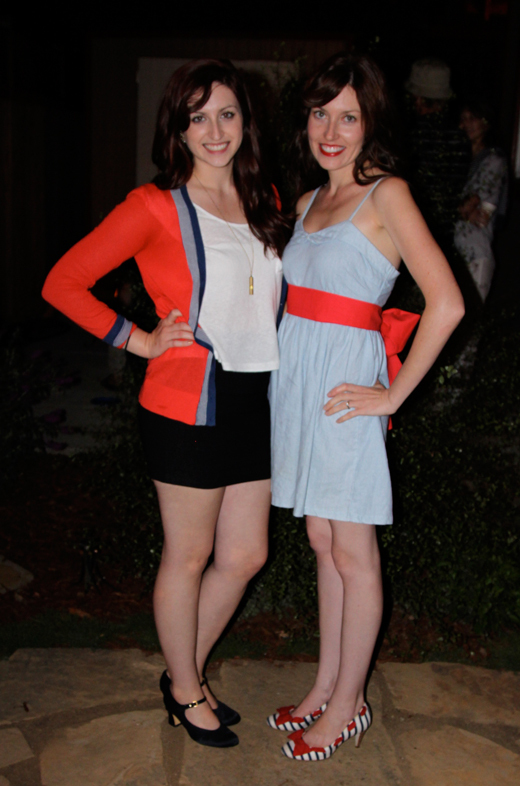 It was a wonderful celebration with all the people I love! Everything looks so great. Happy late birthday!! I love that you threw yourself a party! That is so fun. I so would do that. 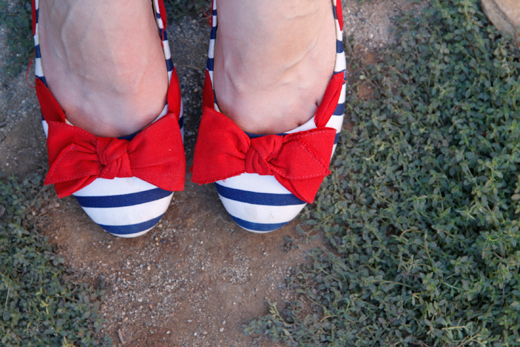 The nautical theme is seriously cute. Everything looked beautiful & that food looked so scrumptious. Your shoes were perfect too. I'd say HUGE SUCCESS!!! Totally know what you mean! 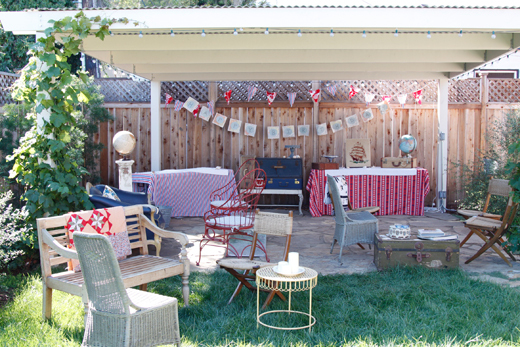 It's almost easier to throw your own party when you are a control freak (I threw my own going away party, just because of this).